Classic cheesecake infused with creamy pumpkin, plus a double dose of pumpkin spice - it's baked both in the cake and the crust! Alright, you guys… you knew this day was coming. I warned you the best I could, and gave you a few other delicious fall food options to tide you over, but I couldn’t wait any longer. Did you notice we’re more than halfway through September? Or that the first day of fall is only five days away? You guys have even been showing some love to my Pumpkin Cheesecake Snickerdoodles and Peanut Butter Pumpkin Fudge, for which I’m extremely grateful. It’s always fun to see when older posts get a new lease on life. But 2015 is a new year, and I simply can’t pass up the opportunity to cook more pumpkin treats. Not only does it make my house smell amazing (no scented candle can ever come close to that true baked pumpkin smell, amirite?) but, well, it’s pumpkin spice cheesecake we’re talking about here. It is everything that embodies the sweetness and comfort of fall. And when you add a dollop of whipped cream, a sprinkling of more pumpkin pie spice, and a drizzle of caramel sauce on top? Seriously, who wouldn’t want a slice of this cheesecake? It’s extremely moist and smooth, even without baking it in a water bath, but that’s probably all thanks to the creamy pumpkin inside. 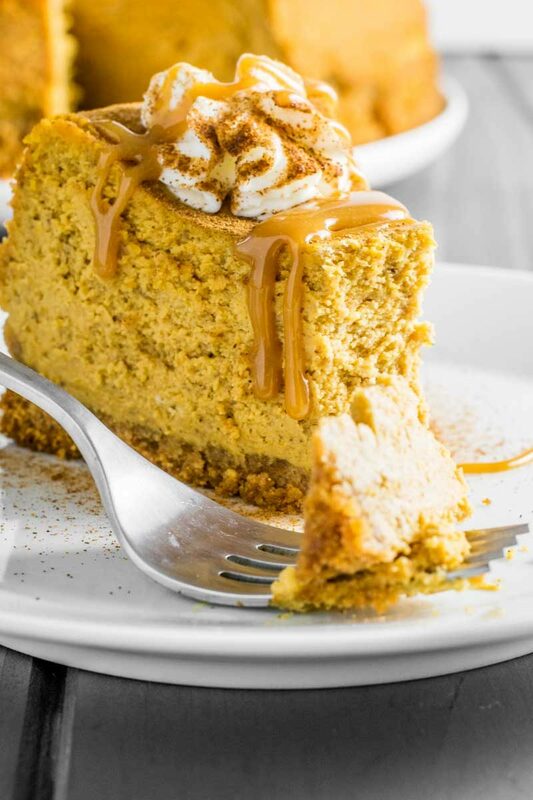 Pumpkin pie spice is used both within the cheesecake and the graham cracker crust, giving you that extra dose of what everyone is craving around this time of year. And I highly recommend whipping up the caramel drizzle – the cheesecake still tastes amazing without it, but I think you’d be missing out if you skipped it! I wanted to be upfront that this recipe is written to not use a water bath. For those that might not know, cheesecakes are typically baked in a springform pan which is then wrapped in foil and placed within a larger pan filled with water. This method helps prevent the top of the cheesecake from cracking. I’ve made this cheesecake a few times and the top comes out “mostly” unblemished (meaning maybe 1-2 small cracks) without a water bath. I’m okay with this because I always tend to spill the water when using a water bath and I’d rather avoid the hassle. However, if you’re more graceful than I am (not hard to do!) and you’d rather not have any cracks along the top of the cheesecake, be sure to use a water bath! Looking for more pumpkin recipes? Be sure to check out Peanut Butter Pumpkin Fudge, Pumpkin Cheesecake Snickerdoodles, Pumpkin Spice Cream Horns, Pumpkin Cheesecake Dip, Pumpkin Pie Spice Recipe, and Pumpkin Coffee Ice Cream. In a small bowl, mix together graham cracker crumbs, sugar, and pumpkin pie spice. Add melted butter to bowl and stir until all ingredients are damp and lightly clumping. Pour pumpkin spice crust mix in the bottom of a 9-inch springform pan. Use your hands to firmly press mixture to the bottom of the pan and about 1/2 inch up the sides. If needed, use the back of a spoon to smooth everything out. Place plan in the oven and bake for 8 minutes. Remove pan and place on a wire cooling rack to cool. Let crust cool completely before adding filling, about 30 minutes. Preheat oven to 350 F again (if needed). Using a stand mixer (or hand mixer + large bowl, add cream cheese and light brown sugar. Beat on low speed until fluffy and there are no more clumps, about 5 minutes. Set aside. In another large bowl, whisk together (do not use mixer) pumpkin puree, eggs, greek yogurt, flour, pumpkin pie spice, salt, and vanilla. Mix until just combined; mixing the eggs too much can result in air bubbles in the cheesecake, which can cause the surface to crack while baking. Slowly add the pumpkin mixture in the bowl with the cream cheese, then set mixer speed to low. As before, mix only until just combined. Run a spatula along the edges of the bowl to ensure everything gets incorporated. Pour cheesecake mix in the prepared 9-inch springform pan. Mixture should almost completely fill the pan, leaving about a 1/2 inch rim around the top. Place the springform pan in the oven and bake for 1 hour. When done, turn off the oven and prop the oven door open with a wooden spoon. Allow cheesecake to sit in the oven for another 45 minutes. When finished, remove cake from the oven and let cool completely on a wire rack (still in the springform pan). Wrap the top of the cake with plastic wrap and chill in the refrigerator for at least 4 hours before serving. In a small saucepan over medium-low heat, add caramels and evaporated milk. Cook until caramels have melted and sauce is smooth, whisking frequently. Allow sauce to cook for 1 additional minute, then remove from heat. Allow sauce to cool for at least 10 minutes before using. When ready to serve, remove cheesecake from springform pan (tip: run a butter knife around the edge of the pan to help loosen the cheesecake) then transfer to a serving plate of your choice. As cheesecake is cut and served, drizzle caramel sauce on slices of cheesecake. If desired, sprinkle with more pumpkin pie spice and add a dollop of whipped cream on top. I was wondering if I could substitute sour cream for the greek yogurt? Just wondering if you have ever frozen this before? I often freeze other cheesecakes as there are always so many pieces left over so I freeze to take out at a later date and they freeze beautifully but have never made one that used any type of pureed ingredient like this one does. This looks great! I’m wondering what size spring foam pan you use? I’m planning to make it for Thanksgiving! Hey Amy! Sorry about that – you can use a standard 9-inch springform pan for this recipe. what size springform pan!? i have never made a cheesecake before 🙂 i really want this to be my first attempt! Hey Kristine! Sorry, I forgot to specify – you can use a standard 9-inch springform pan for this recipe. Hi! Wondering if I can use any other type of pan besides the spring form pan? I forgot to buy one and now I’m stuck home the day before thanksgiving with only my regular baking pans.. ?? Also in your directions you did not tell us when to add the salt? I assumed it was with the pumpkin purée mixture but I realized after everything was already mixed. Not sure weather to add the salt now or just not add at all ? ? Oh, and thank you for catching that about the salt! It’s added near the end, so you should be fine to add it to the pumpkin mix now. Hey Rory! Sorry to hear that 🙁 Do you know what size springform pan you used? I think 9 inch – 10 inch works best. How long should I wait before taking it out of the springform pan? Thanks! 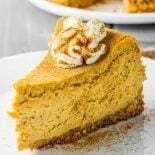 This is so yummy and interesting classic pumpkin spice cheesecake. I tried this kind of recipe before but this is unique. Instead of 1 tbsp sugar i took honey! Thx for sharing! I will try your variant, Chrisy! Oh my! 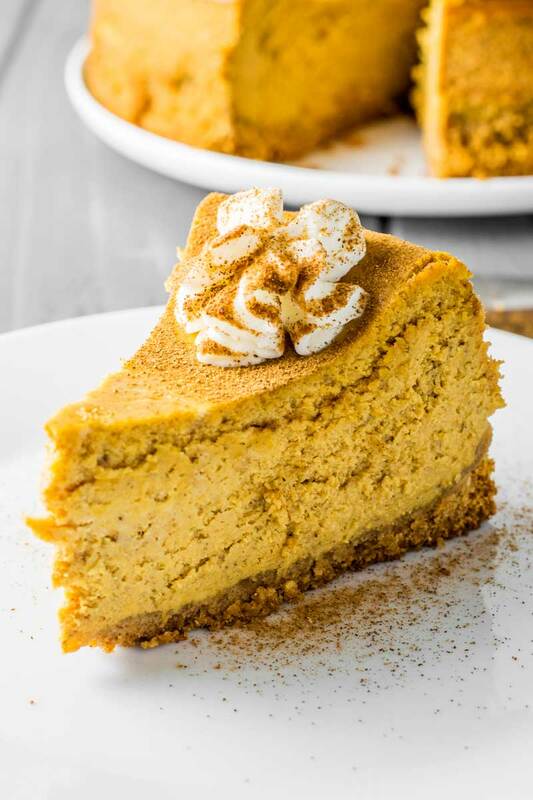 This classic pumpkin spice cheesecake was delicious – and so easy to make! Thanks so much! Can I add chocolate chips to this recipe and if so, how would that affect the qty of the other ingredients and the cook time? I’ve made this twice and we all love it, I just had a request to make this for a birthday but they wanted the chips added and I’m not sure how to alter the recipe to include them.